I leave on Saturday, March 10 to serve on a Global Volunteers project in St. Lucia. I’ve never been to the island, but from what I’ve read, it is very lush and beautiful. Unfortunately almost 30% of its population live in poverty. Community leaders in Anse la Raye invited Global Volunteers to send teams to help deliver essential services to the children in their village with the hope that by working together, over time, the cycle of poverty will be broken. The St. Lucia project is new. I will be a member of only the second team, so this will be a learning experience for everyone. I just got my assignment and was thrilled to learn that my team will be working with 75 preschoolers, from infants to age 5. The first team returned a few weeks ago with lots of helpful information, including a list of things that the preschool needs. 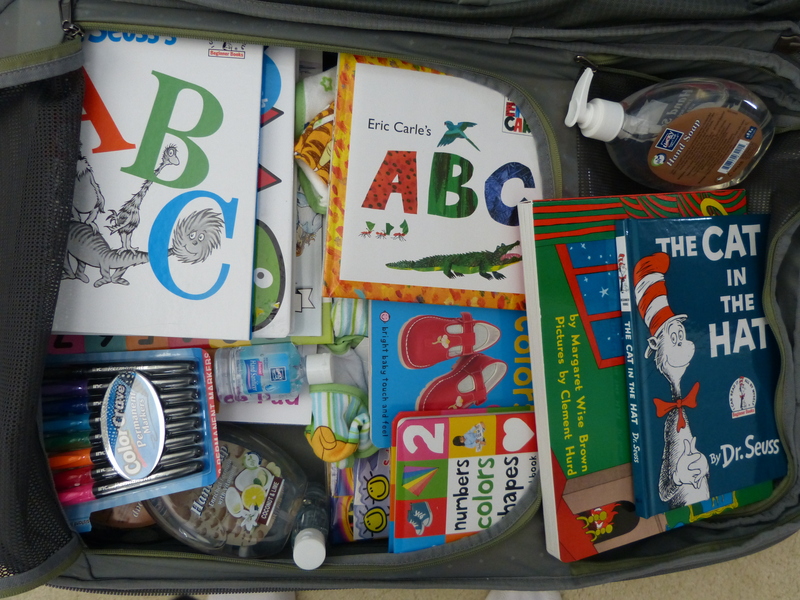 Books, school supplies, soap, hand sanitizer and baby bibs were in short supply, so for this trip, I am packing very differently. Ah, Dr. Seuss, I’ve missed you. We spent oh, so many nights together. This will be a fond trip down memory lane. Good thing I own a luggage scale. This stuff alone puts me at 29 pounds! Fortunately, I have never been a fashionista because this stuff took up half of the one checked bag I’m allowed. I chose to work with Global Volunteers because I love their philosophy. Teams only serve where they are invited. They work under the direction of local leaders, doing whatever those leaders request. Because self-reliance is a primary goal, the volunteers work hand in hand with the locals. In fact a key requirement is that there be at least as many locals working on a project as there are volunteers. There is no proselytizing–no hidden religious or political agendas, other than a desire to promote world peace. The organization cautions its volunteers to remain flexible, noting that things don’t always turn out as planned. Well, considering that my INITIAL plan was to serve in Italy last October, and I had to cancel because my retina inconveniently decided to detach 6 days before I was scheduled to leave, I figure I’ve had a bit of experience with plan changes. I’ll be going on this trip alone. I don’t know anything about the other volunteers on this second team–how many, where they are from, who they are, but all will be revealed by next Saturday night. We will be working all this first weekend, but will have a break the second weekend, so I’m hoping to get a chance to see the island. You are such a great person. You are also very brave to go alone, but if I know you, you will met them all and make many more friends on the plane & on the ground. have a safe trip & keep us all posted. I love your adventures, I always feel like I’m there with you. I just spoke with two volunteers from the first team, and their insight and suggestions were so very helpful–I believe I have packed everything I need for me, and have room in my carry on, so I’m off to buy more stickers and markers. No more books, though. They are way too heavy! I’ve been asked to speak about my experiences with Global Volunteers by the local YMCA, so I’ll be taking lots of photos for my talk, which is scheduled for mid April. You guys can let me know which ones are your favorites–and I’ll use them for my presentation. Sounds like a fascinating adventure! How wonderful that your volunteer work is in such interesting places. Dear bodacious babe, adventure seeker, lover of the books and the babies…..
Be on the look out for the local family doctor or pediatrician. You can always bring Reach Out and Read to their attention! (We just reached 3 million US low-income babies, toddlers and preschoolers)….and spreading the word in the Phillipines, Guam and Italy. Shell: Glad you made it there safe. I am sure the place will never be the same after you have been there for a few week. Good Luck and make sure you read to all those little children. OK how many babies will be on Jet Blue coming back to New Jersey? ALL of them. They are SOOOO cute and cuddly. They call me “Miss”.